In an age where gay culture and attitudes toward homosexuals are stronger than ever, Pride may come as a shocking reminder that only thirty years ago gay people were not only vilified but considered as the lowest of scum even amidst a nationwide miner’s strike. Verbal abuse and sometimes estrangement from shamed families were just the tip of the iceberg of the horrific homophobia that was commonplace in mid-80s Britain, and wherever they seemed to go they were met with disdain from the cautious everyman, brainwashed by AIDS propaganda and malicious tabloid headlines. Put shortly, it was tough times for everyone back then. 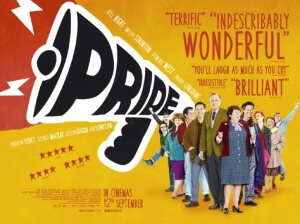 Pride, however, instead chooses to focus on a simple story of two worlds colliding – in this case, the Lesbians and Gays Support the Miners group and a small Welsh mining community – and making it as light-hearted and accessible to audiences as possible, which they most certainly succeed in. The idea of two communities that are polar opposites coming together isn’t anything new, but we’re keen to guess nobody’s really done it with Welsh miners and gay activists. That pairing alone sets up an infinite amount of possibilities for either comedy or drama, and this film manages to take advantage of most of them. For instance, a couple of initially-resistant miners are intrigued by the flamboyant and energetic dance moves of Dominic West’s loose cannon actor, and pluck up the courage to ask for dance lessons. The punchline is certainly played for laughs, but there’s also a deeper and more emotional layer to the thought of these two hardened men deciding to let some light and soul into their lives. It’s a universal message, not just reserved for these particular communities the film is representing but for all of us: as long as we let some life into our life then everything seems much brighter. This is just one of the many (in fact, a little too many to count) sub-plots that this simple idea can conjure and make work. We’re not kidding about the overload of sub-plots; the film is PACKED with things going on. We have an underage gay man (played by a doe-eyed George MacKay) who’s hiding his sexuality and activities from his conservative parents, and there’s also an embittered Welshman (Sherlock’s Andrew Scott) who’s juggling his relationship with West’s character as well as past abuse and an estranged mother; and there’s also a comically evil Welsh committee member similar to Bryce Dallas Howard in The Help who seems hell-bent on derailing the campaign with the help of her manipulated offspring; and there’s also a mild-mannered wife and mother who actively gets involved; and there’s also a small group of lesbians wanting to break away from the group and form one of their own… and we’re not even halfway through. As you can probably tell, it’s absolute overload. Normally, a film with this much stuff happening is a bad sign of its capability to juggle several things at once, and there are definitely some that are far more developed than others, but it’s not too bad and the film actually does have a decent balance with all of these sub-plots. We’d just say there’s a little bit of concentration required if you’re keen on following every single event that occurs in the film. The film has an extremely impressive cast of British veterans and slightly-newer faces, all of whom are given a great amount of material to work with and make their own. American Ben Schnetzer features in a spotlight performance as activist leader Mark, complete with an eerily convincing Irish accent and a good sense of roguish charm; also standing out is Scott, who gives his sympathetic character a great deal of empathy and weight. Representing the vets, Imelda Staunton has an absolute ball with her role as a committee member of the Welsh town our heroes visit, and she does an outstanding job at conveying her character’s lovable nature especially as she explores London’s gay community like a giggly schoolgirl. Paddy Considine is as lovable as ever as the direct link between both groups, and an early scene where he makes a speech in a gay bar is powerfully delivered and charismatic to a point where it’s overbearing (in a good way, of course). Bill Nighy, despite top billing, doesn’t have as big a role as one may be led on but he’s still quietly entertaining and has perhaps the best scene in the movie – it involves his and Staunton’s characters, it’s all in one unedited shot and it’s a very mundane activity. What they talk about, and how they say it, makes the scene so grand, and it would be criminal to spoil it here. In terms of things that are technically bad about this movie, there aren’t really that many; though if you don’t like being bombarded with multiple stories and characters vying for attention then this probably won’t be your film. But even then, they’re good characters that have had a lot of attention given to them by a good writer and a good director (though the constant zooming in on characters or items can get repetitive and annoying after a little while) who really seem to love their source material as the gay and lesbian characters all love each other in their own little way. Ladies and gentlemen, we have found in Pride the modern-age equivalent of The Full Monty… and yet it’s somehow less flamboyant. Pride is an immensely likable and uplifting crowd-pleaser that should get audiences excited and emotional for the well-written characters and enjoyable – if over-stuffed – plot threads. In two words: Pride rocks.